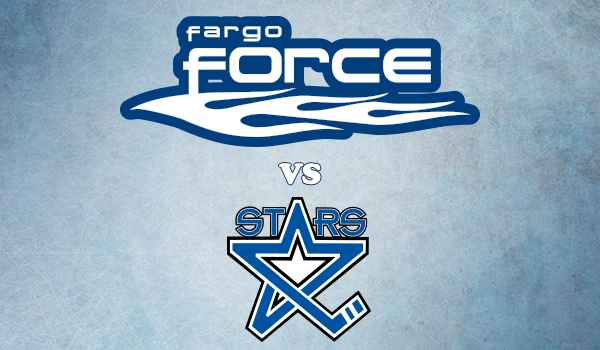 For the first time in the 2014-15 USHL regular season, the Lincoln Stars will venture away from the IceBox to play two road games at Scheels Arena in Fargo, ND against the Fargo Force. The two teams will play the rare Thursday night tilt, and then also on Friday evening. Puck drops at 7:05pm CST for both games. If you you'd like to keep track of the Stars this weekend in Fargo, you can follow the boxscores online via Pointstreak, listen to Stars radio announcer Mike Melbye on 93.7 FM "The Ticket," or watch the games live on FASTHockey for a fee. The Force enter these two games against Lincoln with a record of 4-1-0 (8 points) in five games played, and are currently in second place in the USHL western conference. The Force are 2-0-0 in two home games this season, both coming against the expansion Madison Capitols. Fargo is led by talented '97 forward Denis Smirnov, who has scored 5 points (1g, 4a) in five games so far this season for the Force. Smirnov was originally acquired by Fargo in the 2014 Indiana Ice dispersal draft. Last year for the Ice, Smirnov racked up 41 points (15g, 26a) in 47 games as one of the younger players in the USHL. Smirnov is definitely a player the Stars will want to keep tabs on in these two upcoming games. He's deceptively quick, has great vision, and silky smooth hands. As good as Smirnov is, the MVP of the Force through five games is undoubtedly goaltender Mathias Israelsson. The overager ('94) from Sweden, Israelsson has played every minute for the Force and has posted a record of 4-1-0, a goals against average of 2.56, and a save percentage of .918%. It would not surprise me at all if Israelsson starts both games against Lincoln this week. I watched the Force play two preseason games at the 2014 USHL Fall Classic in Sioux City, and they really struggled offensively at times. I believe most pundits thought the Force might struggle a bit this season, but they have certainly played very well so far, thanks to Israelsson. In my opinion, the Force are going to live or die with Israelsson in net. He's an incredible talent, and will be a workhorse for the Force this season, but I think Fargo lacks scoring depth at the forward position. Regardless, this should be yet another good test for a Lincoln Stars team looking to play more consistent hockey and potentially get their first two road wins of the season. I'll be watching both games on FASTHockey and will report back here with recaps. Goalies combined: .867 save pct. Goalies combined: .897 save pct. So, the Stars are off to a better start than last year by nearly every metric. Also, Lincoln's four opponents this year have a combined 14-8-1 record and all of them (Tri-City, Sioux City, Waterloo, Muskegon) are likely playoff teams this season. Earlier this week, the Stars traded forward Keegan Ward to the Muskegon Lumberjacks for forward Chris Dodero. Dodero ('96) hails from Bloomingdale, IL and tips the scale at 5'9", 177 pounds. In 102 games played in the past three seasons with the Lumberjacks and the Chicago Steel, Dodero scored 30 points (13g, 17a) along with 66 penalty minutes. Chris has committed to play college hockey at Colorado College in Colorado Springs, CO.
During his time with the Steel, Chris was teammates with current Stars Biagio Lerario and Patrick Polino. I'm a big fan of this trade. Stars add more USHL experience and depth at the forward position with the acquisition of Dodero. Click here to follow Chris on Twitter. Also, per the Stars' official website, the team has signed Corey Courtney (Athletic Trainer/Equipment Manager/Strength Coach) to a four-year extension. Anyone who has been a Stars fan for any length of time knows how important Corey has been to this team since he started in 1999. Congrats to Corey! He really deserves a lot of attention for what he has contributed over the years. Here's to many more years with the Lincoln Stars. Thanks for the heads up, Anon. Not sure why it says that. Right on the front page, too. Hopefully they'll fix it soon so it doesn't confuse people.